If you fancy yourself a skier, you’ve probably considered a trip to the powder capital of the world, Japan. You may have heard the nicknames, “Japow” or “Japanuary”, and wondered what all the hype was about. The travel distance, the investment of time and money, it seems just out of reach – almost dreamy. For a long time, it was just a fantasy for our crew, but then things came to a boiling point last season during a trip to Alaska. Our week-long stay was right in the middle of storm cycles. Beautiful bluebird days are nice, but no powder is no bueno. It became obvious, we needed to go to a place where it was almost guaranteed to snow. As we all know, a trip such as this does require some essential new gear. We heard that a little effort goes a long way in Japan when it comes to venturing out through the backcountry gates, so touring equipment was on our pre-trip shopping list. Serious gloves and durable shells for the deep snow, the right travel bag to protect our skis, it was definitely an investment. The silver lining, however, was our ability to fund our travel expenses with the Active Junky cash back we earned on all our gear. We found flights for $600 from San Francisco to Tokyo and affordable Airbnb’s in Niseko’s Grand Hirafu Village. Simply put, it was better than imagined. The snowpack is unlike any other I’ve ever experienced – it’s truly hard to find the bottom. And as rumored, it does snow constantly, making deep turns and large pillows abundant. But the snow is only part of Japan, our real cultural experience was waiting for us in Tokyo. The city has its own type of magic, from shrines to street food, honor and craftsmanship run strong. You’d be hard-pressed to find a more polite and service-oriented people, a cleaner or quieter city. Noting beats a face-full of snow – pure joy. The endless deluge of powdery light snow makes that a frequent occurrence. That much powder can cause a man to wonder if he’s really dreaming – the snow in and around his face confirms it’s real life. Day after day, Hokkaido offered up primo conditions, making turns like this commonplace. Mt. Yotei stands guard over the town of Niseko. Normally veiled by the wintery conditions, we saw this site just as we were leaving town – truly majestic. It all felt familiar, yet so different at the same time. We couldn’t help but admire many aspects of the Japanese way of life. Tokyo has a very unique arcade culture. Club Sega is one of those must-do experiences, and as you can see, emotions run high. The crew stands memorized by one of the exhibits at TeamLab Planets, an interactive digital art museum. A definite must see when in Tokyo. One the most unique experiences of the trip, the tiny shop could barely hold our crew as we enjoyed meat and veggie skewers, cooked quite literally right in front of us. Tokyo can be confusion – the bright lights and foreign characters can be a lot – sometimes you just need to take a minute to sort it out. Niseko from above. It was a pleasure to call this little snow globe home for a week. Locally-owned Bar Gyu proved to be the perfect spot to wind down and trade ski stories from the day. A must see when in Niseko, if only to walk through its tiny door. The perfect picture to sum up a dream-like Hokkaido experience. With big pillows and powdery landings, it’s a powder hound’s playground. The face of pure focus. The best powder in the world demands 100% participation. The snow really stacks up, creating these wild cornice shapes which proved to be the perfect launching pads. With a bottomless landing, it was a dream come true. The island of Hokkaido has a lot to offer, both in-resort and backcountry. Sometimes, we learned, it’s worth it to earn your turns. The feeling of weightlessness, and the excitement that comes with it, is what Hokkaido evokes. Whether you float through the air or snow, it’s constant weightlessness. Top to bottom, it was a trip for the record books, and it’s more within reach than you think when you start putting your AJ cash back to work as your travel budget. We took the BCA Float 42 2.0 half-way across the world, to the mecca of skiing, Hokkaido, to run it through the paces – here’s the verdict. It’s cleverly designed with high quality materials. Equipped to accommodate your every need, from a helmet carry that stashes away for the downhill to a custom ice axe holder in the tool compartment. 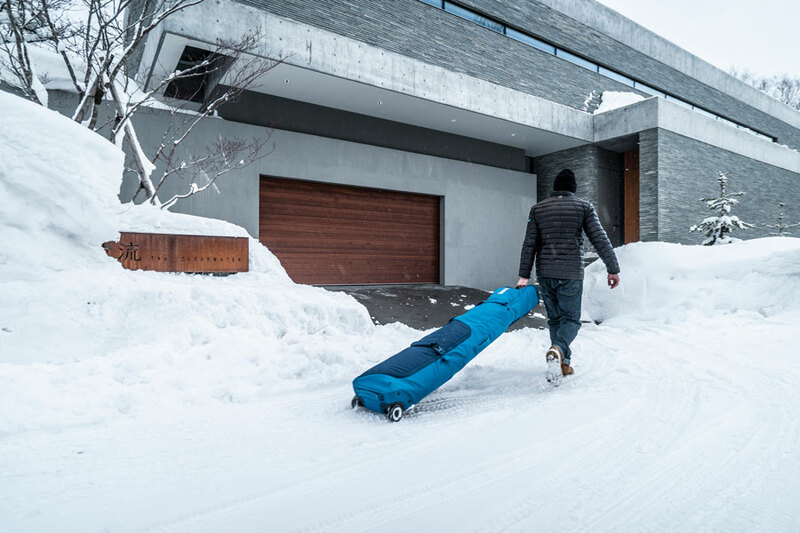 The diagonal ski carry is practical, easy to access, and tucks away nicely when not in use. The main compartment feels spacious due to the smaller size of the 2.0 canister, and comes complete with a rear zip panel giving you quick access to the gear at the bottom of your pack. But we really can’t emphasize the new 2.0 design enough – with the canister stored nicely in the airbag pocket, you can load up more gear and keep the main compartment better organized (which we all know can get a little hectic when fully loaded). And as if that weren’t enough, it’s 15% lighter – which may not sound like much, but at the final strides of that skin to 11,000+ feet, we’ll take every ounce less we can get. 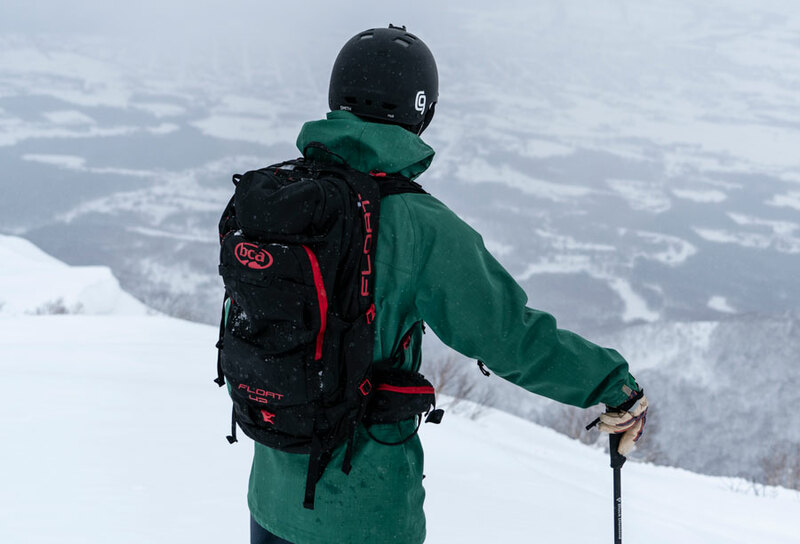 Backcountry Access Float 42 Avalanche Airbag Pack Starting at: $601.14 Not only did our trip to Japan take us into some of the best backcountry terrain in the world, but it took us to the clean and quiet streets of Tokyo, and the Float 42 performed flawlessly. When skiing, the compression and shoulder straps, and overall back design make you feel at one with the pack. But we were really impressed by the comfortability factor when it was loaded up for our long weekend in Tokyo. The pack truly hugs you, seemingly reducing the weight and making it very manageable. We could spend hours going on about all the features and benefits, but it’s the same story – cleverly designed with high quality materials. 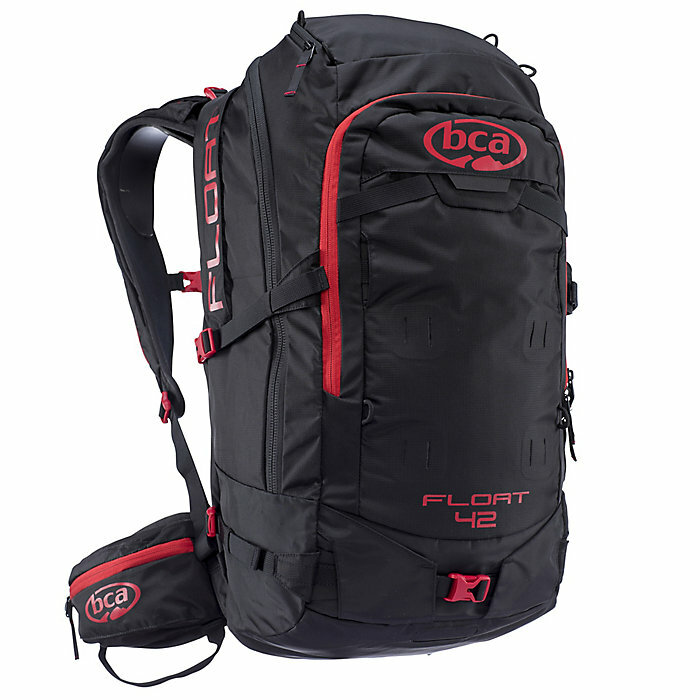 While many of the reviews will recommend this pack for professionals, I’d say anyone who does ski hut trips (or overnight trips in general) should seriously consider the Float 42. The new 2.0 design and 42 liter size give you space to fit all your overnight gear, and the back design makes skiing with a heavy pack easy. For those day trips, synching down the compression straps make the pack feel weightless. As a more aggressive skiers we enjoy hucking a cliff or cornice, and we can tell you in full honesty that could easily forget we even have this thing on. My point is, you don’t have to worry about it being too big. Finally, we come to price which I find to be very reasonable, even with the canister sold separately. Most packs of this quality and functionality will run you over $1K and probably closer to $1,500, so getting it for $700 is a steal. All things considered, this pack is hard to beat. Its thoughtful design lives up to your every demand while not feeling clunky. Its high quality material is sure to stand the test of time. And its affordability makes it accessible to all. Sure it's light, but is it strong enough? A classic question in the world of AT bindings. We figured what better place to test the strength of the new toe piece, and binding in general, than in Japan. Our first stop – Niseko United, comprised of Annupuri, Niskeo Village, Hanazono, and Grand Hirafu – had an interesting mix of in-resort and out-of-bounds terrain which made it the perfect proving ground for an AT setup. After multiple days of ripping around in and out of the resort, we're happy to report these bindings live up to the hype. We had highly variable snow conditions, classic Japan powder, wind-blown hard-pack, and everything in between and these bindings held strong through it all. They even withstood the torque of tossing 360s off the plentiful pillows. Safe to say, you can confidently ski aggressively in all conditions. Dynafit TLT Radical FT Starting at: $309.60 Though we felt confident in our testing, we decided to go cat skiing, just to be sure. Our experience at Iwanai Resort was better than imagined – bottomless powder on perfectly angled slopes with an optional cornice entry. But we all know that excitement can disappear real quickly when your bindings pop off every run (like some AT bindings do). And while admittedly timid on the first run, we quickly realized we had nothing to worry about – they didn’t come off once. Okay, now for the uphill. Again, the stronger toe piece comes in handy, contributing to a sturdier feel than most AT bindings, especially when trying to hold an edge. Further adding to the underfoot strength is a runner linking the toe and heel pieces. This acts as a ski stiffener when locked and shock absorber when unlocked. Dynafit also addresses a common problem in AT bindings market, risers that are next to impossible to adjust with your ski pole. Their new risers have ridges and an angular design, giving you just enough leverage to adjust heel height easily. And of course, they’re light – almost half the weight of other products on the market – which can do wonders for your endurance in the backcountry. For both uphill and down, the TLT Radical FT is one of the top options on the market and should definitely be considered. Lastly, we come to the price point. 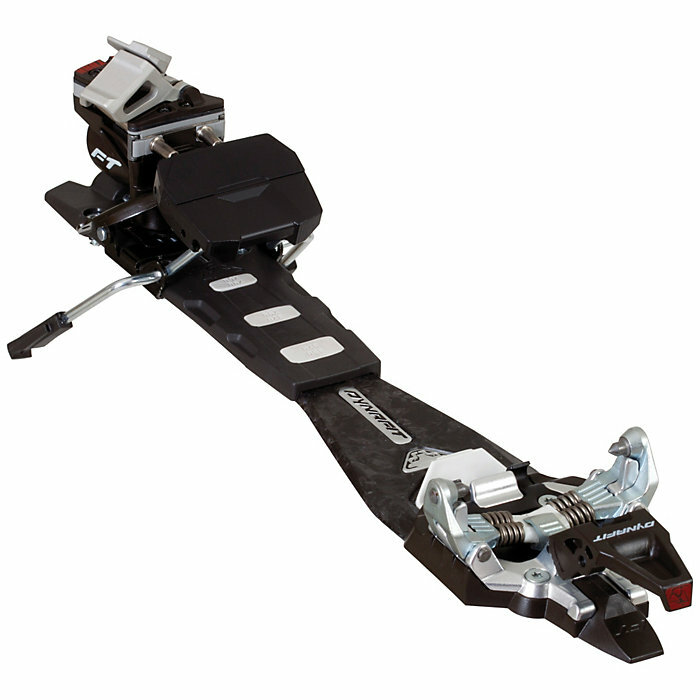 This is pretty middle of the road on price, as far as high performance AT bindings go. But you can often find discounted pricing, pulling it down to one of the lowest prices you’ll find. And after traveling thousands of miles (we know they’re not exactly gentle with checked bags) and skiing thousands of feet, they still look like new. 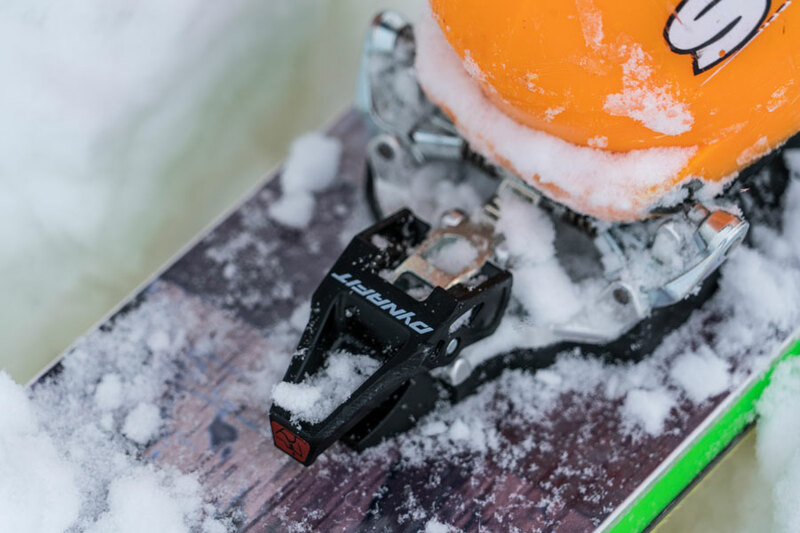 Of course, pick the binding that makes the most sense for your skier type and preferences, but this binding should be a serious contender for anyone who spends time in the backcountry. Happy Touring! 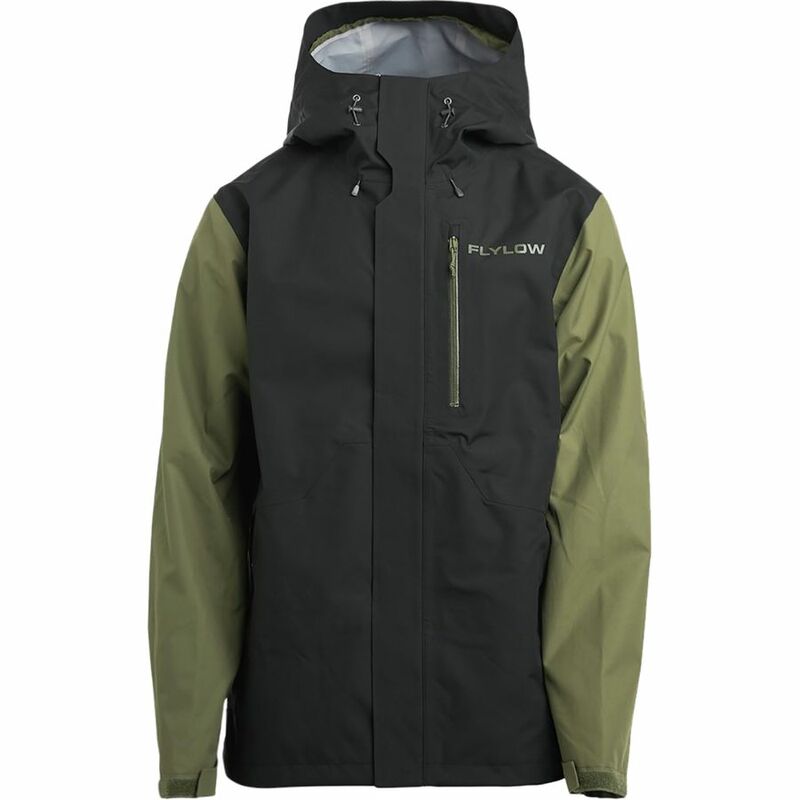 Flylow’s Knight Jacket is not your average shell so we couldn’t test it in average conditions. 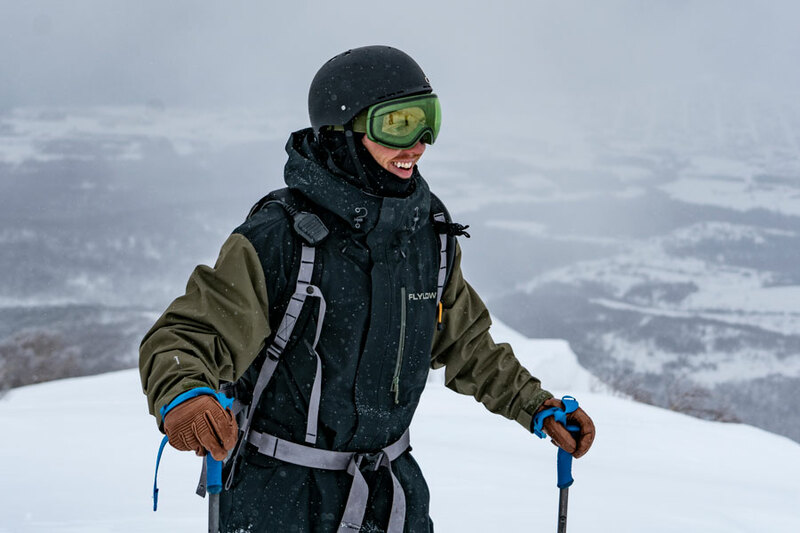 In order to be sure the three-layer fabric really provides outstanding protection against wind, rain, and cold, we went to the legendary north island of Japan, Hokkaido. The jacket is built to look good and has solid maneuverability with a softer fabric than most hard-shells. When paired with the Men’s Flylow IQ pants in green, it provides a uniform look, making you sure to get noticed wherever you go. But it doesn’t just look good. We wore this jacket for a week, swimming in Japanese powder, and it kept the snow out and warmth in. Not to mention, the pocket and vent design meant we were never fidgeting with straps. When combined with the fabric durability, we’d be happy to take this thing out with just a base-layer for a day tour. In wintry Japan, however, we went with a base-layer, mid-layer puffy and this jacket, which translated to the most comfortable day on the mountain we’ve had in a while. But we do have to mention one aspect Flylow could improve upon. A tighter neck area and softer fabric at the top of the main zipper, around your mouth, would be a huge value add. There were a couple of brutal periods where the helmet-compatible hood was up, artic wind howling, leaving us wanting just a touch more warmth to aid my balaclava in protecting my face. Overall, my verdict on the Flylow Knight Jacket is it’s an impressive shell that offers more protection than most shells on the market today. Its layering and breathing capabilities make it an ideal mid-winter resort shell that can also stand up in the backcountry. Then, factor in the style points, and this jacket is hard to beat. But all that usually comes at a price, right? Yes, for quality gear, you do have to shell out more, but at this price point, you’d be hard-pressed to find a more quality constructed piece – the value is hard to beat. If you’ve been looking for a multi-purpose shell that’ll withstand whatever you throw at it, the Flylow Knight Jacket is what you’ve been looking for. Look good, feel good, ski good! The Hestra family is known for its high quality and comfortability, but to know for sure, we had to put them to the test. After swimming in powder for a week, it's safe to say the Fall Line Glove is truly one of the most comfortable ski gloves on the market. The incredibly soft interior makes for a warm and comfortable fit. It has a velvety feel to the interior with an exterior of soft leather. The natural curve of the fingers allows for a snug fit and high dexterity, whether grabbing ski poles, maneuvering snowboard bindings or transitioning AT bindings. The elastic wrist is durable and adds to the secure feel of the glove with a significant and strong velcro square that doesn’t loosen or pull apart throughout the day. The wrist design truly makes it easy to get them on and off and still keep a great fit. Our testers hand is 7”, give or take a quarter inch, from his longest finger to the bottom center point of his palm – he wore a size 7 and the fit is right on. Insulating foam noticeably helps for warmth and adds significant padding and protection on the outside of the hand. This comes in handy when skiing through trees and bumping branches out of the way, not to mention it’s the perfect cushion for giving fist bumps to friends on the mountain. I would rate them middle of the road for warmth level, but that puts them right at the front lines as my everyday glove, from Hokkaido, Japan to my home mountains in the Colorado Rockies. Their ideal temperature is anywhere between 20 and 40 degrees, but you’d be alright down into the teens. Below that is a no go – we wouldn’t suggest using these gloves in single digits. But on the bright side, they don’t become sweaty when temperatures rise. Hestra Fall Line Glove Starting at: $132.49 The biggest surprise to these gloves is the small carabiner they come with. We thought we’d remove it immediately, but it turned out to be quite useful. The rings on each glove (with metal reinforcement – a nice bonus as far as durability is concerned) provide the perfect carabiner attachment point which is great for hoking the two gloves together to avoid dropping one. It’s also quite useful for hooking to a helmet strap when carrying all your gear, or quickly clipping to a belt loop or a backpack strap when taking them on and off, making glove management easy. Price point is pretty average for a quality ski glove, but you know you’re getting quality when you go with Hestra. 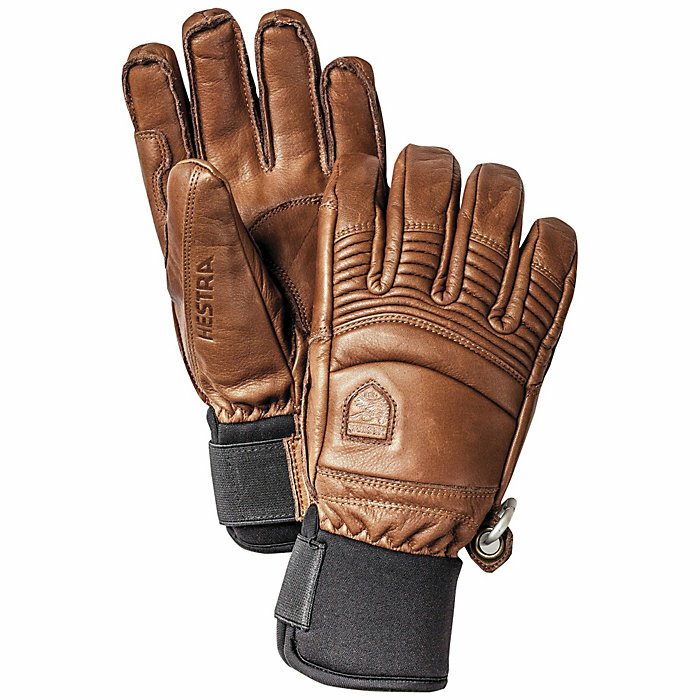 We would say the only downsides of the Hestra glove is the inability to withstand cold weather and the need to seal the leather periodically. That being said, when they’re consistently sealed they do a great job of wicking water and keeping your hands dry even in wet snow. 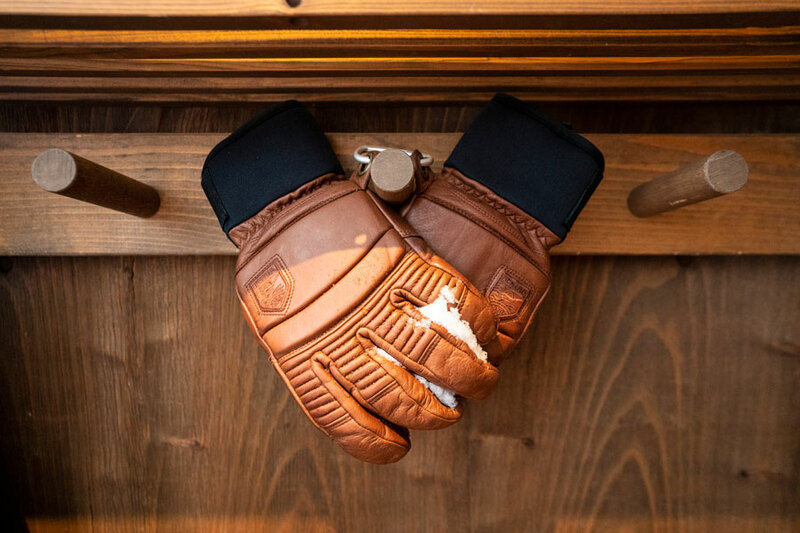 This glove is comfortable, durable, good-looking, functional, and great for all winter sports activities or just hanging outside in the cold (if you’re into that). From a top-notch brand family, North Face, the Impendor Down Hybrid Hoodie has a reputation to live up to. But put simply, this is another quality North Face product. We love the look and feel of this down jacket – not only did we feel good wearing it, but we received a few compliments (and who doesn’t like those?). 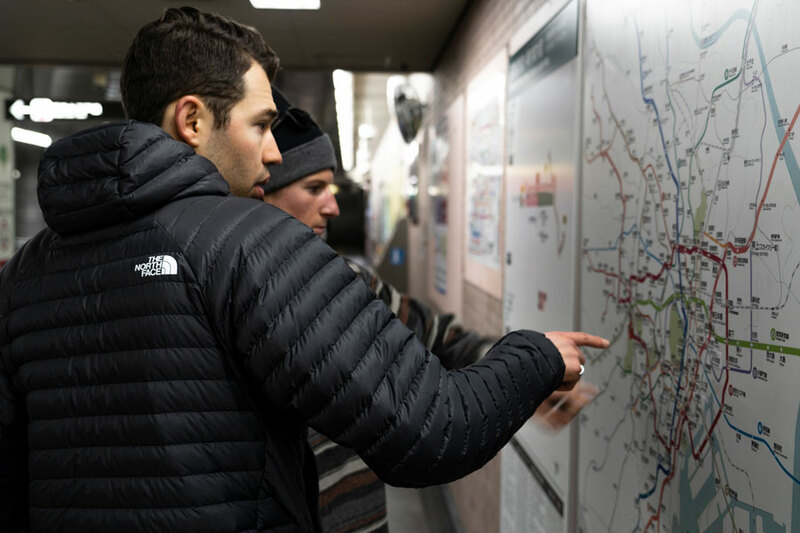 We opted for the TNF Black color, which is really tasteful – it’s not straight jet black, it’s a black base with light grey lines that give it the illusion of being textured. Making it the perfect piece for both the wild mountains of Hokkaido and the urban streets of Tokyo. Our favorite part of this jacket was the cut—it’s stated as a ‘slim fit’ which is rare among men’s down jackets. The sleeves are long enough for lankier body types and the fit is not too tight around the torso. The slim cut actually gives the jacket a sleeker profile which we found advantageous for layering under shells and other ski jackets. During the 10-day trip to Japan, it was our go-to warmth layer and held up against everything we threw at it. Only a few loose feathers managed to escape, which is pretty good for most goose down jackets. The North Face Impendor Down Hybrid Hoodie Starting at: $158.24 Filled with 800 fill goose down, it’s WARM to say the least—significantly warmer than my last down jacket which was also stated to be 800 fill down. As someone who ‘runs cold,’ we found this jacket to keep me warm even when temps got into the low teens. On the colder ski days, we wore base layers, this jacket, and a shell, which was sufficient. Treated with a water repellent DWR finish, it performed quite well when subjected to Japan’s relentless snowfall. It probably wouldn’t hold up against the wetter, PNW snow, but in a light sprinkle or drier snowfall, the DWR coating kept the down filling completely dry. Plus, that’s what shells are for. The underarms have a breathable fabric which helps regulate body temperature, especially when skiing or walking. We also really liked the interior breast zipper pocket, the well-fitting hood, and the waist cinch to keep wind out. The jacket is extremely light (only 13.4oz) and can easily be packed down into a stuff sack or backpack for easy storage and transportation. This jacket is best suited for those who want a do-it-all down jacket that’s functional in both the mountains and the city. The technical features give this jacket the ability to perform in below-freezing temps, while the stylish, slim cut give it the illusion of being a trendy urban hoodie. In 10 days of rigorous testing, we never encountered a thing we didn’t like about the jacket. 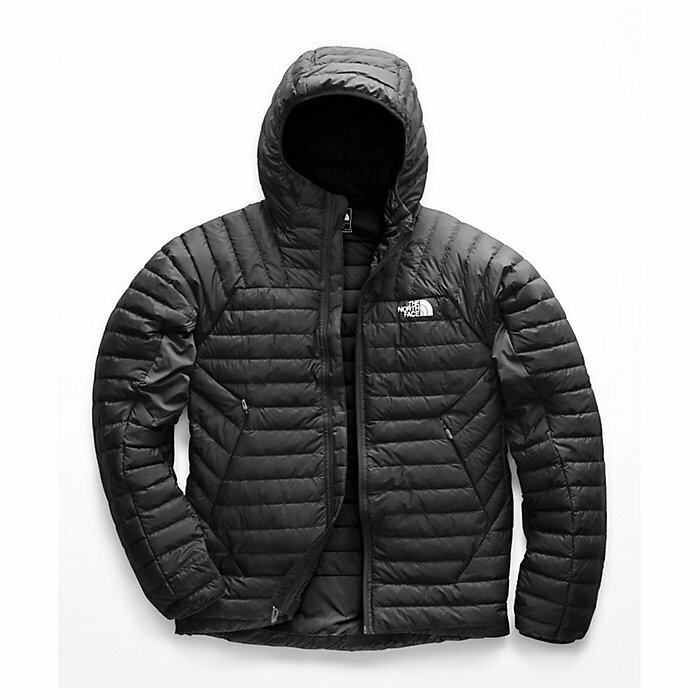 It fully performed in every application tested – North Face really outdid themselves this time. Highly recommended for just about everyone! We knew we needed a solid bag to safely transport the skis. Problem was, every ski bag we’ve ever had was always lacking in the organization and durability departments. Even with packing squares and stuff sacks, we were never to secure our accessories during air travel. Then after 2-3 seasons use, the exterior is trashed and so the cycle went. Needless to say, when we found the Thule Roundtrip, we were excited to put it to the test. Right off the bat, the Roundtrip impressed. With pockets for ski poles, two sets of straps for skis (attached to the bag in designated spots), and a foam insert to wrap skis, it seems they’ve thought of everything. Perfectly sized for two pairs of skis (even powder skis at 130 underfoot), one set of poles, and ski outerwear. There’s just the right amount of room to fit two ski shells, two pairs of ski pants, and gloves in between each pair of skis so you’ll have options. It even comes with two stuff sacks which slip over the tip of your skis to stay in place. Between those and some packing squares, all my gear was organized and locked in place for the long voyage to Japan. 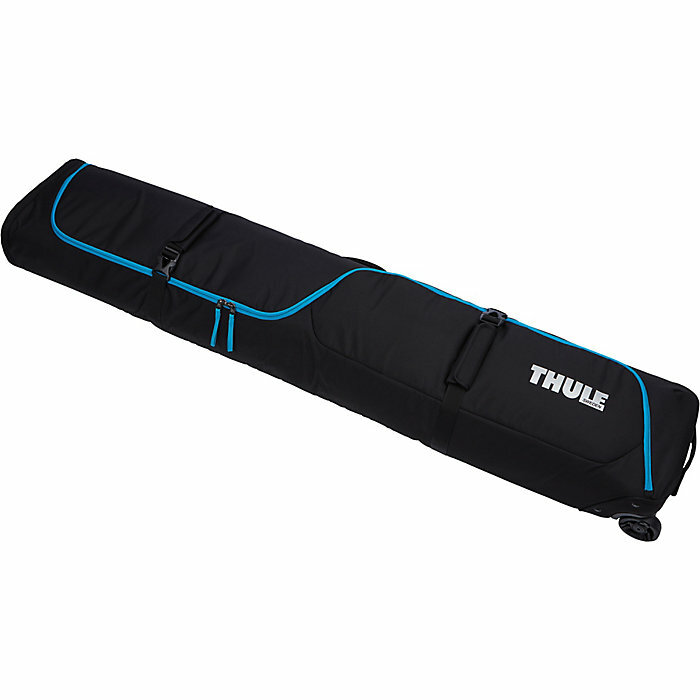 Thule Roundtrip Ski Bag Starting at: $240.76 The exterior of the bag is durable and strong enough to protect all your gear through air travel, but also slim enough to make for easy handling in the airport. It’s clearly made with excellent material – tough enough to withstand the airport baggage handling system without showing any signs of wear and tear. And the compression straps which double as handles also came in clutch. A surprise feature is the wheel design – they’re oversized which seem to help with maneuverability, and keep you high and dry in the powdery streets of Japan. The interior is lined with a plastic, waterproof layer which was ideal to keep everything dry on the snowy island of Hokkaido. They’ve also installed structural reinforcements at either end of the bag which works surprisingly well to keep the bag rigid, making it easy to roll and maneuver. As far as price point, it’s on the higher end, but this piece definitely lives up to the Thule reputation of quality which makes it worth it. The overall design, from the handles to the wheels is well thought out and functional but also looks good (which is key in the world of winter sports). As for organization and durability, we couldn’t be happier – the Roundtrip over delivered. We only have a small critique – the pole sleeve was too small to fit the powder baskets on our poles so we had to put them in upside down – not a huge deal in the scheme of things, but feel compelled to mention it. After taking it half-way around the world and back, we highly recommend the Thule Roundtrip – we know we’ll be using it for many years. Happy Trails!